The place is very conducive for group gatherings, special occasions or chill out with friends. 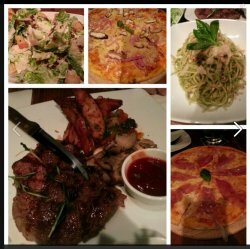 The Bar is spacious and for dining, they can accommodate a lot of guests.The steak there taste good and i like most the thin pizza.My friends and I enjoyed bottles of champagne while waiting for Christmas and they house nice music so you don't really get bored. The place is clean and they have a lot of service staff to attend to your needs immediately. The place is very conducive for group gatherings, special occasions or chill out with friends. The Bar is spacious and for dining, they can accommodate a lot of guests. The steak there taste good and i like most the thin pizza. My friends and I enjoyed bottles of champagne while waiting for Christmas and they house nice music so you don't really get bored. The place is clean and they have a lot of service staff to attend to your needs immediately.